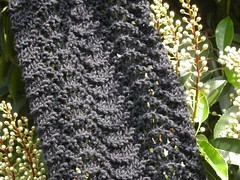 This took about 3 sittings and was a nice relaxing knit and looks very effective in the black. I think I might suggest this to my girlfriend who is learning. Made as a gift in advance for my incredibly supportive midwife. It always gives me a good feeling to give a handmade gift but for me to know the wool was a gift to me and I am passing that on, means more somehow. 90% of what I make is given to friends and family. I’m just that kind of gal.